2013 marked a monumental year for Spark Tech. 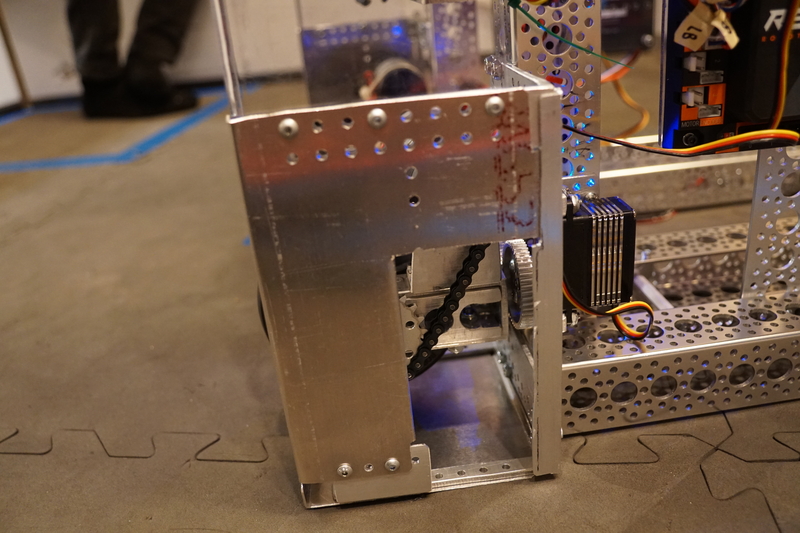 Inspired by FRC Robots, the very first FTC Team of Spark Tech, Team 3531 The Short Circuits, pioneered what would become the Iconic Spark Tech Drive - our Swerve. Back then due to limited electronics, Short Circuits created a swerve drive with two servos on each wheel, one being a large 755 MG Quarter Scale and another being a 485 HB. These servos provided barely enough torque to turn the heavy swerve pods. These pods had a Tetrix DC Motor driving it, the motor being mounted to the frame of the pod. The weight on the pod made it take nearly forever to turn the wheels, but it served the purpose - maneuverable and strong. But the Swerve was not perfect yet. After Short Circuits disbanded, the Swerve tradition was picked up by their legacy team, 7013 Hot Wired. Their very first year, the Block Party Challenge, they decided to adopt that Swerve drive. 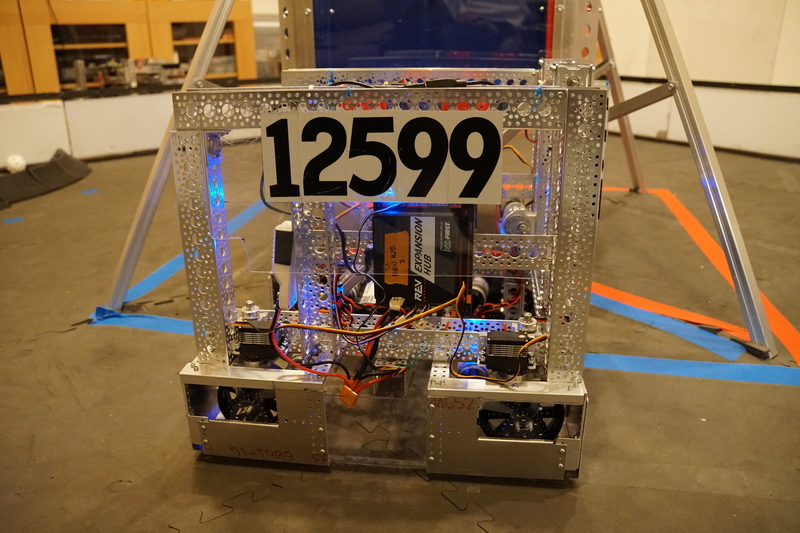 This led them to several victories, all the way from the first ever competition till the World Championship, where they won the Winning Alliance Captain. From there, Hot Wired used a rendition of this Swerve Drive for three out of their four years in FTC, which all led them to Worlds. They improved theirs by reducing the weight of the Swerve Pod's frame, allowing them to turn using only one 755 MG Quarter Scale Servo. 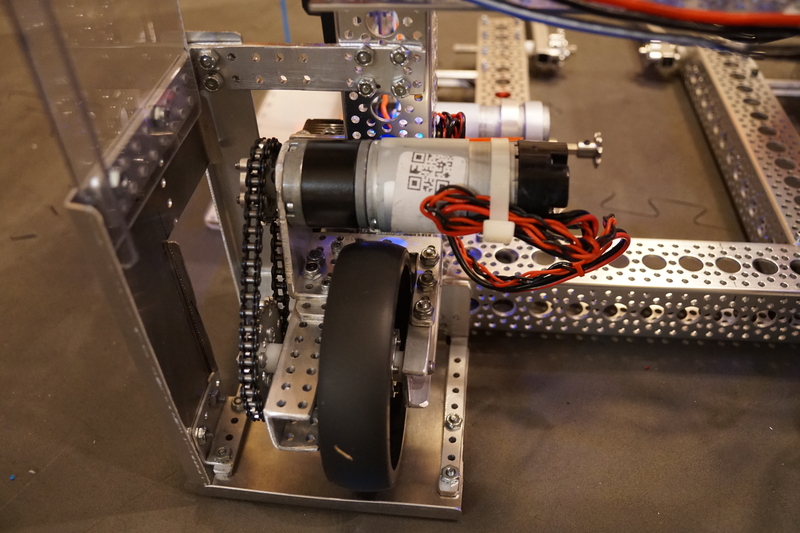 However, Hot Wired was not able to adapt their swerve to the new NeveRest motors, keeping the weak Tetrix DC Motors. This caused the motors to break frequently, but the Swerve still functioned. And that leaves us. Being one of the two legacy teams of Short Circuits and Hot Wired, we felt obliged to adopt the tradition of the Swerve Drive during the Relic Recovery Season in 2017. But we had to make some improvements first. We decided to compress the frame even more by utilizing our CNC. We cut down tubes to form a bent shape, which brought down the frame to a few inches in thickness. We overlapped the new NeveRest 20 Orbital over the back of the wheel in order to conserve space. Finally, we stuck to the 755 MG servo that Hot Wired used. This was seemingly the perfect swerve drive - a strong motor, fast wheelbase, and a compressed Swerve Pod. What more could we do? The answer - a whole lot more. We've changed quite a lot of minor details on this Swerve Drive that has led to major changes in the way that it functions. For starters, we have a 30:1 output on the wheel. We used to have a 1:1 chain ratio on the wheel with the NeveRest Orbital 20. We've changed it to have a 1.5:1 ratio with the Orbital 20s, so we could have more pushing power and retain a manageable level of speed. Next, the wheels turn a lot faster. Like twice as fast. Actually, 1.6 times as fast to be precise. We've switched the servos from the large 755 MGs to HiTec's D980TW Servo. 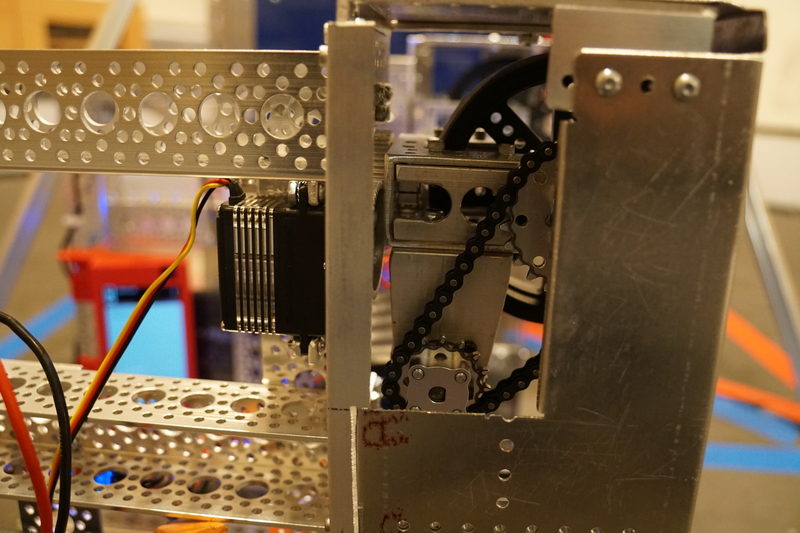 This servo provides the same speed as the 755s, but has more torque. We switched to a 1:1 ratio on the Swerve Pod's turning, as the servo could handle the torque of the turn while also turning the Pod faster. Finally, it's compatible with Actobotics. This may not mean much at first, but it's rather helpful when assembling everything. 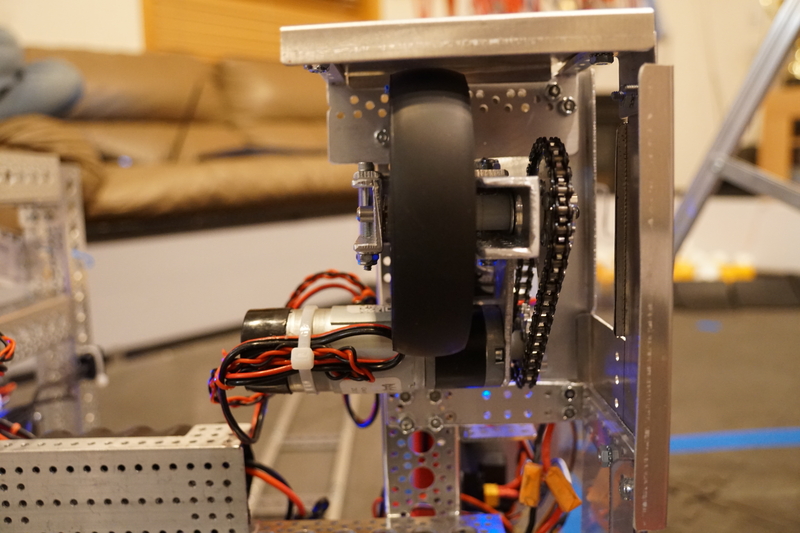 Using the Actobotics gears on our previous Swerve Drive, which was built on Tetrix, took a lot of work to get everything aligned. 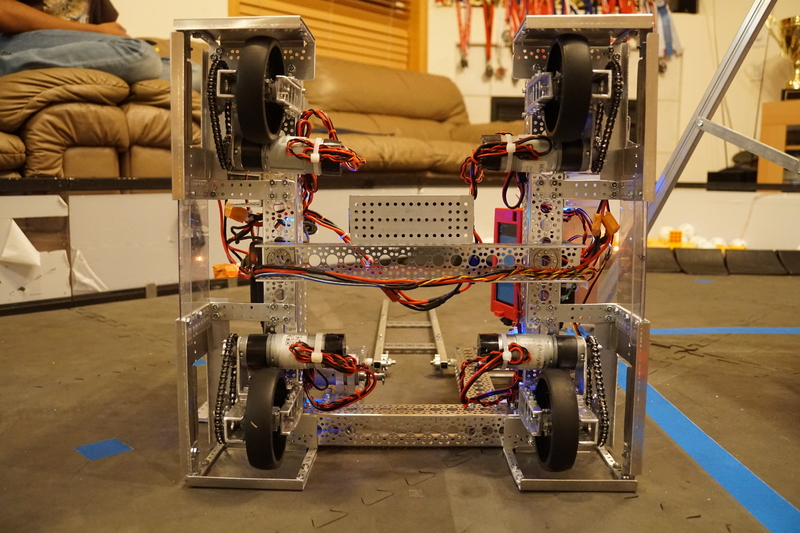 We also have a frame around the swerve unlike our last year's robot, El Tigre. 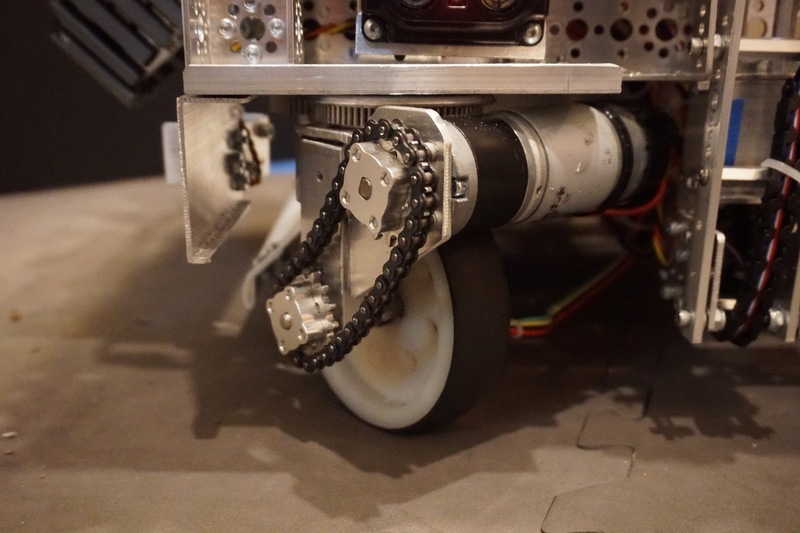 This gives us a much more robust robot with an overall compatible system that meshes well with all the components we have.